Pictures from our Croatia trip HERE. Tony's restaurant near Vela Luka, Korcula Island, Croatia. In about a week, my wife and I will go to Croatia to celebrate our 20th anniversary. We are doing a cycling trip with a company called Backroads. We start in Split, then travel to the islands of Brac, Hvar, and Korcula. We end up in Dubrovnik. I will post photos, connectivity permitting, to THIS LINK. What if a blog post fell in the forest and there was nobody there to read it. I probably happens millions of times per second. Until now, the last time I updated this blog was 2011. Now it's towards the end of 2013, so it has been a while. Blogging was fun for a while, but I moved on to other things, like the stuff listed below. Move over, GT Souths! My buddies took me to the easily looked-over Black Diamond BBQ and it was by far the best I have had in Indianapolis in my 7+ years here. Try the pork sammich: hot & sweet. You will NOT be disappointed. Just make sure your afternoon meetings don't require your full alertness! And the artwork inside is worth the trip! Today They Might Be Giants releases a new album for us grown-up kids, called Join Us. After a couple listens, I dig it pretty good. I like it better than The Spine but I haven't decided whether it is as good as The Else (got a signed copy at a concert a few years back) . You can pick up the whole kaboodle over at your friendly Amazon store for 8 bones if you are into the whole downloading thing. This is about the coolest little gadget I have seen in a while! 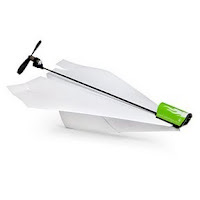 It's a little electric motor you clip to your paper airplane. Supposedly runs 90 seconds on a 20 recharge. For $20 you can sign me up for a couple! Carbon fiber makes the add-on super light. Makes me wish I was a teacher so I could have whole bunch of these zooming around the classroom.